Inexpensive laser therapy is very likely to make most wounds feel better and heal faster. And the reason is simple; laser energy greatly improves local circulation, local lymphatic drainage, & local cell activity. It helps kill germs and reduces inflammation and edema. All great things when it comes to wound healing. We use the laser routinely after surgery to reduce post op swelling, inflammation and pain as well as to speed healing. And we will recommend it highly on any wound not likely to heal quickly with more traditional treatments. Phytosphingosine is naturally present in skin and is highly effective at helping damaged, cracked skin to heal and we use a lot of it on hot spots, ear infections, and other skin diseases. It's applied once a week until the wound is all better. This is not an alternative treatment to wound washes but rather something additional you can do (just $4) to make wounds heal faster and with less scaring. It also reduces the itching that occurs when skin heals. It makes the elastin in the skin more flexible while the wound heals so this is especially important for wounds over joints. What we call "Blue Stuff" and use routinely to prepare the skin prior to surgery and also dispense for all sorts of minor wounds is really called Nolvasan Solution. It contains 2% Chlorhexidine which is a pretty good killer of bacteria, virus’, and fungus. It’s used on children in many hospitals as a wound wash and is gentle on raw tissue. It’s safe to lick. Nolvasan is excellent for cleaning wounds, rashes, cuts, hot spots and so forth on both dogs and cats. And other mammals. Nolvasan, with our without added medications should be applied liberally several times daily. This product is slightly more expensive than the wound treatments discussed above. And it doesn't kill germs nearly as well. But, what it does do well is keep open wounds MOIST, which is ideal, and also provides a protective barrier or "liquid bandage" over the wound. So, we will recommend this gel for some types of wounds. Derma Gel is the number one wound care herbal hydrogel - designed to be applied to open wounds of horses, dogs, cats and other animals. Essential for any equine or canine first aid kit. Derma Gel's natural herbal formula provides a barrier against contaminants and bacteria, repels insects and maintains an ideal percentage of moisture to enable rapid healing. Bandaging the affected area is therefore not required. 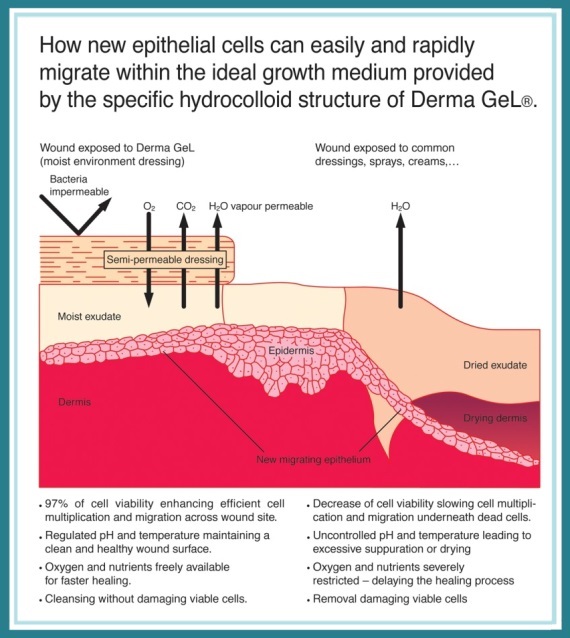 Derma GeL is an isotonic formulation indicated for intensive and rapid wound care. It ensures a uniform porous barrier of protection against bacterial attack, foreign contaminants, avoiding desiccation and maintaining an ideal percentage of moisture. Skin traumas are re-covered by cells genetically and completely identical to the cells that were initially available which means no proud flesh, and hair grows back the same color. Super safe on tissue. Safe to lick. And non irritating. Especially good for large open wounds, wounds under tension, and for post op incision care, especially if you don’t want a scar. Derma GeL maintains cell viability to a very high rate and consequently favors a rapid hair regrowth in the original color, stays where it is applied, and will not run off the treated surface. ApplyDerma GeL generously several times a day, as needed. To help prevent skin proliferation, extend application to the surrounding area. When needed, bandage over the gel. After 24 hours, leave surface uncovered as the product ensures a protective barrier making a bandage unnecessary. Avoid the use of this product on abnormal cell proliferation,warts and ringworm. Generic Panalog or Gentizol ointment is marketed as an ointment for treating ear infections but this ointment used to be a very expensive human product for treating burns because it killed staph and yeast so well. Now that it's a generic product, it's excellent ... much more effective than Neosproin type products ... for treating cuts, minor wounds, and ear infections in pets as well as humans. I keep it in my tackle box and first aid kit on the boat. Gentizol has 3 potent ingredients including gentamicin antibiotic, clotrimazole anti-fungal, and betamethasone, a strong, synthetic topical steroid for inflammation and itching. Note: Gentamicin, the antibiotic in this (and many other prescription antibiotic ear ointments) is quite effective, but can potentially cause inner ear damage if the ear drum is not intact, so Gentizol should not be used in dogs with an obvious head tilt or in dogs not first examined by a veterinarian. And once again, remember that many ear infections are complicated and need more aggressive care than just a topical ointment alone. The nice thing about Gentizol is that it's a cheap, convenient, and all purpose ointment for most minor cuts, scratches, rashes, minor ear infections. And it works pretty darn well for many minor wounds. A little nostalgia ... I mean history... about Panalog Ointment. Back in the late 1960's ... long before I went to vet school, and before I was in the Army, and before I went to Cornell, I hung around vet clinics watching and helping. And the product vets used to give out left and right for ear infections, wounds, cuts, and to apply to surgery incisions was a product called Panalog Ointment. It came in little tubes or big jars. And I think it was originally made by UpJohn. Then Fort Dodge bought out UpJohns' veterinary products. Then Pfizer bought out Fort Dodge. Now Pfizer has spun off it's veterinary products into a new company called Zoetis. But I don't think the Panalog brand is sold anymore because the patent ran out and there are several generic equivalent brands available including Animax, Malotic, and Gentizol. At any rate, whenever I use this ointment it takes me back to a different time in veterinary medicine. Back to a time when every vet clinic had a big glass jar with a heart full of heartworms floating around in formaldehyde in the waiting room, and when the pharmacy had a distinctive odor from coppertox, lymsulfa dips, and all the other aromatic compounds we used to make wound packing gels and bolus' for bloat and diarrhea. I mention this brand name product even though I don't usually sell it because a lot of people ... especially "horse people" know about it, use it. and get good results. And it's super non toxic on just about any type of animal on just about any body part (except the eye). I think it's mainly ionized salt water with a mild chlorine based antiseptic. I simply like our more potent concoctions better... either Nolvasan or Tricide mixtures. They usually work better and cost less. A lot less. desired area, then rub it into the coat. 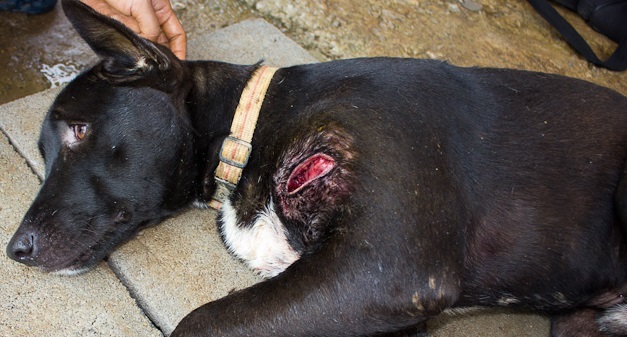 pet in warm weather being treated for an open wound. Works great for about a day at a time. We treat several wound cases a day and while most respond well to frequent cleaning, surgical repair as needed, and antibiotics, so cases are very challenging. Or take a long time to heal. This page is about the things we offer for treating wounds whether they be simple or major. On your right, I discuss medications that we use to treat wounds. And that you can get to treat wounds at home. And below, a little about bandages and E Collars. Also about Bag Balm which I think most people buy for themselves more than their pets. We have a wide selection of vet wrap type bandages available in different sizes and colors for you to have on hand for veterinary as well as human emergencies and routine wound care. We even have a new wrap with a built in repellent to hopefully keep your pet from chewing at the wound. Veterinary cohesive bandages are great in that they conform to the shape of the body part you’re wrapping and self sticking meaning no clips or pins are needed. They breathe, they canned be torn by hand, are non-constricting. They’re soft and comfortable enough to use on most pets. These wraps should be applied at approximately 50% stretch and not so tight as to impair circulation. Usually changed daily, and not directly over open wounds unless first treated with wound dressing and gauze. E collars are clumsy, but very useful when needed to force your pet to leave a delicate wound or incision alone for a few days. "For bunches, caked bags, cuts, sore teats, chapping, and inflammation." Imagine; while laying asleep at night, the udders would freeze to the manure pack and then when the poor cow stood up the next morning, the frozen, tender skin would rip off. And then she’d walk into the barn at 5am to have her raw udder scrubbed for milking. Bag Balm is full of lanolin and hydroxyquinoline and while a little greasy, is very effective for dried hands, skin, cuticles, cuts, wounds, dog and cat bites, chapped lips, hemorrhoids, scrapped knees and so forth. We sell more for human use now than for pet first aid care. Sailors and snow skiers are especially fond of bag balm. It’s great as a post tattoo skin soother. For paw abrasions, incisions after surgery, & dry scabs on pets. Interesting Historical note: Originally Bag Balm contained a tiny amount of mercury and was famous for healing wounds “overnight”.